A fork in the road leads to two towns: one town where everyone always tells the truth, and another where everyone always lies. You meet a man at the fork in the road, and wish to know which town he hails from. What question do you ask? what color are your shoes ? Wow. That is actually pretty legit. I was looking for "Are you a tree-frog? ", but that works too. I was reading up on Diogenes and his rebuttal to Plato's definition of man as "featherless biped" (Diogenes presented a plucked chicken). It reminded me of this. I was mostly curious if others had heard the riddle or some version of it. It was originally presented to me by my high school French teacher, who ascribed it to a movie he had seen. It is completely legit! It's just not the type of thinking we usually apply to riddles (or philosophy). A version I heard was that you wanted to go to the town of truth tellers so you would ask the man to take you to his town since either way he'll lead you to the truth town. lol i didn't think about it. i have a way of overcomplicating things while being straightforward, but yours makes equal sense. See, and in the movie that answer (or some version of it) is considered the "correct" answer, because it is derived solely from the logic of the puzzle. "Are you a tree-frog?" (or "What color are your shoes?") is considered cheating, because it doesn't follow the unstated rules of the game. I think what it's getting at (the same as Diogenes' retort to Plato) is that we impose rules or orthodoxies on how we think about and understand the world. Sometimes this can be very helpful (see, for example, the scientific method), but it can also be limiting. Philosophers such as Diogenes or, in the East, Chuang Tzu seem especially apt at pointing this out. Actually, my introduction to Chuang Tzu came from the Christian monk, Thomas Merton, who in this Catholic Answers article is warned against not for being unintelligent, but unorthodox. More credit to you then for figuring out the answer so quickly and naturally. It didn't occur to me until I was told; I got stuck trying to figure out the "logical" answer. I like that once you understand how this riddle works, there are so many answers you can choose from even though this was started with an answer in mind. It's really quite thought provoking. You have any other riddles like this Hidden? I don't know any other riddles like this one. I think koan come closest in spirit, though they operate differently and often don't have literal answers. But both are designed to surprise the mind out of its normal patterns of thinking. My favorite isn't a question, but a statement: "If you meet the Buddha, kill him." Sounds a lot like this one but you're trying to get into the towns instead. 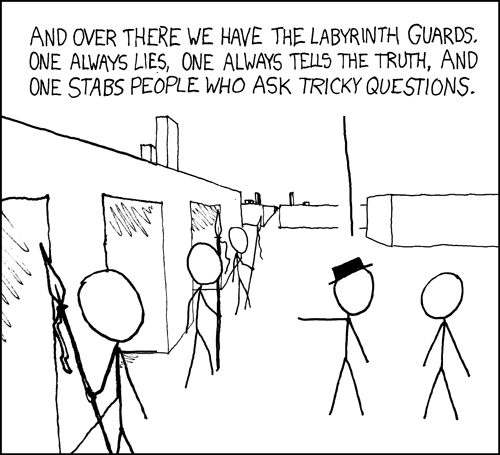 Though if you read the alt text on the original comic, you'll discover that "the whole setup is just a trap to capture escaping logicians. None of the doors actually lead out." "do you need medical attention?!"